Green Bay Packers fans were a little surprised when they used one of their draft picks on a punter. 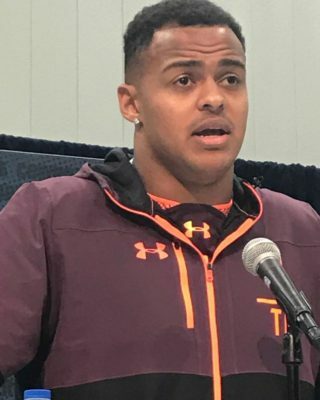 But based on history, the Pack’s selection of punter JK Scott of Alabama in the fifth round of the NFL Draft should not have come as a surprise. Yes, drafting a punter is not a common choice of teams, especially in these days where the draft is only seven rounds. But the history of the draft has shown that punters do have their place in the draft. Here are 12 stats you may not know about punters being taken in the draft. According to Pro Football Reference.com, there have been 169 punters drafted in the NFL since 1959. There were four punters drafted in this year’s draft. The highest choice was Michael Dickson by Seattle in the fifth round with the 149th pick. The Packers chose Scott with the 172 pick in that round. In their team history, the Packers have drafted 13 different punters. Six of them played at least one regular season game in the league. Of the 169 punters drafted into the league, 122 played at least one regular season game. Here’s a by-round (rounds one through seven) breakdown of when punters have been picked in the draft since 1959: First Round-2; Second Round-4; Third Round-14; Fourth Round-13; Fifth Round-26; Sixth Round-17; Seventh Round-18. The highest selection of a punter by the Packers was in 1981 when they selected Michigan State punter Ray Stachowicz with the 62nd overall pick in the third round. The Packers also selected Ohio State punter BJ Sander in the third round with the 87th pick in the 2004 draft. In NFL Draft history, the Packers have selected the most punters, 13. They are followed by the New York Jets with 11 and the San Francisco 49ers with 10. The University of Tennessee has had the most punters drafted with seven. They are followed by Michigan State, Mississippi and UCLA with five each. The Wisconsin Badgers have had one punter drafted: Brad Nortman. He was chosen in the 2012 draft by the Carolina Panthers in the sixth round (207th pick). The most punters chosen in an NFL Draft was in 1978 and 1979. There were seven punters chosen in each of those drafts. It’s important to remember that the NFL Draft years ago lasted upwards of 19 rounds. The draft these days lasts only seven rounds. The most successful punter ever drafted by the Packers was probably Josh Bidwell. He was drafted by the Packers in the fourth round of the 1999 draft, but was diagnosed with testicular cancer and did not begin his NFL career until the 2000 season. He played four seasons with the Packers and then had five years in Tampa Bay before he ended his career with four games with the Redskins. He played in 148 NFL games and was a Pro Bowl selection in 2005 with Tampa Bay.